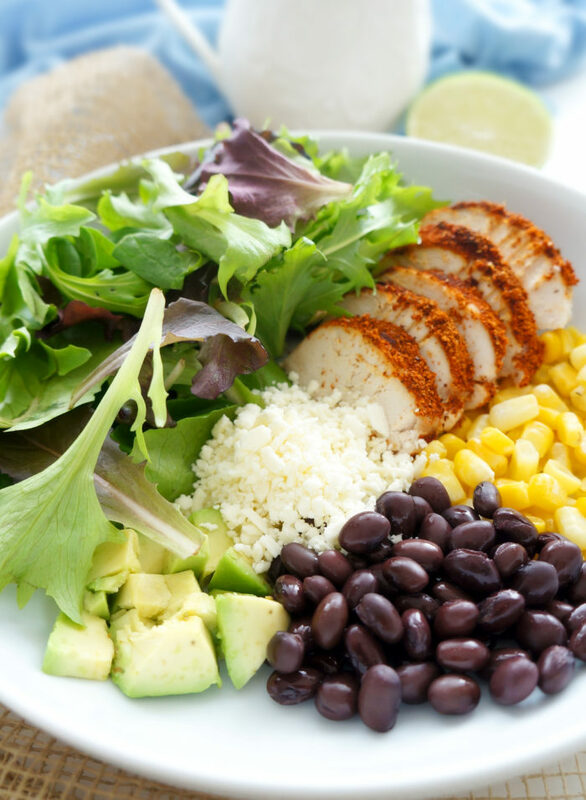 This Cajun chicken salad makes a delicious balanced meal that’s packed full of flavour! The perfect prep-ahead lunch for on the go! Let me just start by saying this chicken salad is pretty much my favourite chicken salad of all times. I could eat it every single day. It was actually originally inspired by my recent honeymoon to Banff. My husband and I were eating lunch at Earl’s Restaurant one day on our trip and I decided to order the Chicken Salad with Peanut Lime Dressing…and boy was it good! So of course, I set out on a mission to re-create the salad at home. And low and behold, we have this masterpiece. Similar to my recipe for Mediterranean Chickpea Salad, this makes a great option for lunch that you can pack ahead of time. Just divide the ingredients between containers, bring along some dressing in a little container and you’re good to go! I even used mason jars one week for a pack-ahead lunch and put the dressing on the bottom of the jar, and then layered the beans, corn, avocado, feta, chicken and put the greens on top so they wouldn’t get soggy. Then just dump into a bowl and mix. If you’re a peanut butter lover like me, you will absolutely ADORE this dressing. And if you’re concerned that this is some wimpy salad made out of a bunch of leaves that will leave you starving, fear not. That’s not my type of salad. This salad is hearty and packed full of fibre as well as protein and healthy fats, so it definitely provides that fullness factor. I hope you enjoy it as much as I do! What’s your favourite make-ahead lunch? Preheat the oven to 375 degrees F. Place chicken on a baking sheet lined with parchment paper. Sprinkle taco seasoning equally on top of each of the chicken breasts, spreading it around so that the tops are fully covered. Bake chicken for 25-30 minutes or until cooked through. Meanwhile, divide the Spring mix, romaine lettuce, corn, black beans, feta cheese and avocado equally between four large bowls. In a small bowl, whisk together all ingredients for the peanut lime dressing. Slice the cooked chicken breasts and distribute equally between the four bowls. Drizzle desired amount of dressing on each serving and toss to combine. Sounds like a great salad. Love all the different flavors you have going on. Thanks Mikki! It’s one of my favourites for sure! This looks like a delicious well-balanced salad!! Ooh this dish has all my fav flavours! Love that cajun spice! Thank you Abbey! I use that Cajun spice mix all the time! 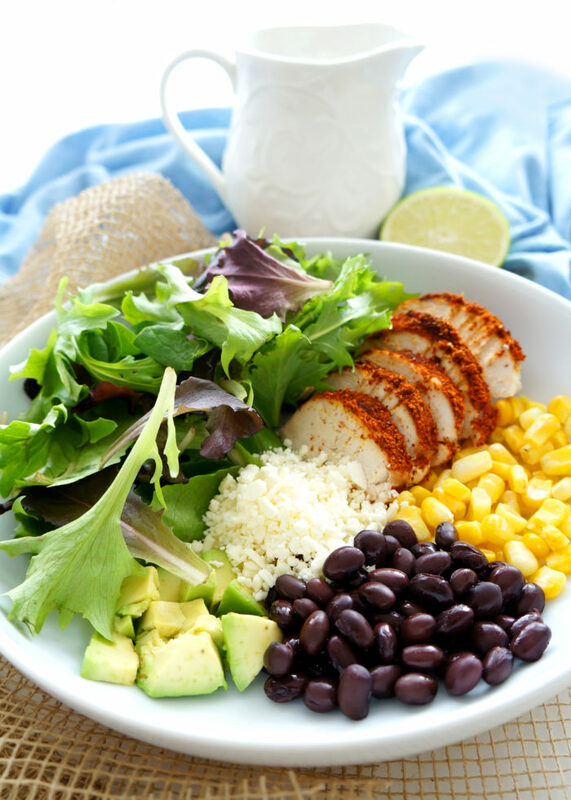 This salad would taste awesome with tofu, especially with the delicious peanut lime dressing! This looks so fresh and delicious! Love the flavors going on. Thanks Jessica! It’s really tasty! This looks great. I take chicken salad to work for lunch most days. Feta sounds like great addition. Thanks Lucy! If you like chicken salad, you definitely should try this recipe out! I’m pretty sure I could eat a big ‘ol bowl of this any day! YUM. I love the addition of feta; I wouldn’t have thought of that with cajun chicken. You and me both Chrissy! It’s delicious! Peanut Lime Dressing??? Whoa! I need that in my life. This looks amazing and your photos are so pretty. Hope you are having a nice weekend. Thanks Julie! 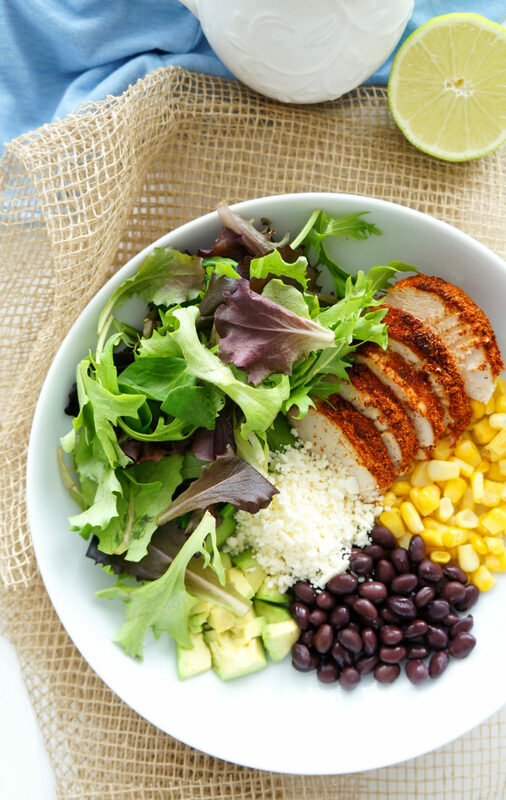 Yes, the peanut lime dressing is my favourite part of this salad! So good! Hope you had a great weekend too! This looks absolutely delicious. 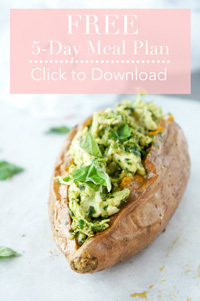 Perfect for spring and warmer days when I usually crave lighter meals. Peanut lime dressing sounds amazing. I can’t wait to try this salad next week. Thanks Natalie! Let me know if you try it out!